Agent Sarah writes on Tuesdays for Agents of GUARD and covers Arrow, console games, anime, and whatever else sounds appealing at the moment. She has a day job in the software industry and thinks cereal is overrated. A couple of months ago, Her Universe announced their annual fashion design contest was returning for 2016. If you’re not familiar with the contest, it’s become very popular in the last couple of years and takes place during San Diego Comic Con. People submit geek-inspired couture outfit sketches, and a handful of finalists actually present their creations worn by a model on a runway at the event. In previous years, the top winner was even able to co-create a piece of apparel to be sold at Hot Topic. It’s a really fun contest that has generated a lot of interest in the growing geek apparel market especially geared towards women. You may recall my Batman Wallet post from some time back, where I declared I’d like to make some elegant apparel for ladies that was Batman themed. When I heard at the beginning of April that the contest was taking submissions through the end of April or so, I decided (rather ambitiously) to just jump in with both feet and see what I could accomplish with a goal of submitting a design in just three short weeks. 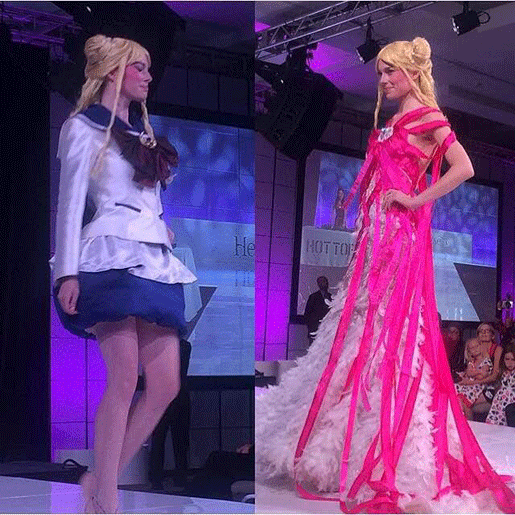 Her Universe founder and Ahsoka Tano voice actress, Ashley Eckstein, hosting the Her Universe SDCC Fashion Show event. Here she wears a Black Widow inspired gown. Week 1: I completely forgot about the contest. I KNOW, RIGHT?! It was so stressful that my brain just blocked it out. Week 2: OH MY GOD, WHAT HAPPENED TO LAST WEEK?! Three weeks is not a lot of time and holy cow two weeks is even less time! You can technically enter up to five designs in the contest, and I decided that I had two ideas that I wanted to flesh out to see where they’d take me. One of the winners from last year, called “Joker’s New Look”. My first idea was an elegant evening dress. I maintain my opinion that Batman apparel does not have to be childish or garish-looking and could be made suitable for adults. What if the dress just hinted at Batman, or even Bruce Wayne? The other concept was something that randomly came to mind as I was looking through past year entries on the Her Universe page. I thought some kind of Bat Signal dress might be fun. Playing with different colors of light beaming through the night sky to signal Batman..I envisioned shades of blacks and blues with hints of yellow and sparkling rhinestones dancing through a flowing silhouette. This would also be a party dress, although probably less refined than the first idea. I decided to work on the elegant black dress concept first. I repeatedly hit walls as soon as I got started. What kind of fabric should it be? I wanted a very deep black, and felt the fabric should be luxurious. Silk? Too thin, wouldn’t hold a shape well. Velvet? Too thick for this application. I do not know a lot of fabrics and I don’t exactly own a mannequin for draping. This was probably going to take more effort than anticipated. After some sketching, I realized the idea in my head wasn’t quite coming across on paper. Black dresses are fine, but how do you make it a Batman dress? I had this idea in my head to somehow work the Batman logo (or a slightly modified version of it) into the neckline or into a cutout on the front of the dress. I hit another wall when I realized that not only are my art skills extremely poor, but… could I even draw the Batman logo? After several hours of logo drawing practice, I finally had a working sketch of the first dress. The dress was still not that interesting and needed…a little pizzazz. After some thought, I decided to add some scattered pearls and crystals stitched into the dress. I dubbed this dress “The Martha Dress”- for Martha Wayne, Bruce’s mother. The idea for the pearls and crystals is meant to be slightly symbolic and comes from the oft-depicted scene in Batman’s origin story where Bruce is leaving the opera with his mother and father when they are robbed at gunpoint, and then murdered in cold blood. In Frank Miller’s The Dark Knight Returns, as well as many other Batman movies and books from then on, Martha’s pearl necklace is ripped off of her, sending the pearls flying. I thought that recreating this scene with pearls strewn across the dress as if they are falling at different speeds might add an element of intrigue. From The Dark Knight Returns by Frank Miller. With a draft of the Martha dress completed, I then moved on to the Bat Signal dress. My concept for this dress was decidedly more hazy- the idea had come to me very suddenly, but I wasn’t quite sure which mix of colors I should use and what kind of overall tone I ought to go for. I did know that I wanted a lot of movement in the skirt and that it might be fun to have the colors change as someone walks in the dress from blue/black to yellow/gold to represent light in the sky. I recalled from my days of hunting for a wedding dress a particular style of skirt on one dress that I’d tried on which was a little too much for my big day, but might really have that ability to transition colors in movement because it would be made of layers of pieces of organza. With the skirt figured out, I moved onto the bodice, which is where the Bat Symbol itself would reside. I decided to not get too carried away with looking at necklines or overall structure on the top and quickly put together a basic sketch of the entire dress. I sat and looked at my two dress designs in horror. I had achieved the very thing I sought to avoid. The dresses very loudly declared “BATMAN” in classic Batman colors. There was really nothing hi-brow or subtle about it. Week 3: I stuffed my drafts in the trash, moved on with my life, and promptly forgot about the Her Universe fashion show and my goals. I haven’t given very much thought to those dress concepts since discarding the drafts and calling the whole thing off. I have thought a little more philosophically about the whole thing- at what point does a piece of apparel become a costume? This project left me with a surprising number of questions. Then again, I didn’t exactly spend a lot of time on it. I’m not sure how I could have expected to succeed without really putting in more than 3 days of effort. It would be like quickly writing a book, and then giving up when someone tells you your first draft has some continuity issues. This was the audience favorite dress from the 2015 show, called Usagi’s Transformation. The dress transforms! But, in writing this article, I’ve realized that the concepts are maybe not as dead as I thought. I do love the idea of this “Martha Wayne” dress in theory. Maybe there’s a better way of executing it. Maybe I don’t need a Batman neckline cutout, or perhaps there’s a more subtle way of suggesting some of the curves of the Bat Symbol on the neckline without using the entire thing. An idea popped into my head to even use some visual tricks to perhaps allow a Bat Symbol to be visible from a distance, but not up close. As for the Bat Signal dress, I’m still not entirely sure that this idea wasn’t doomed from the start. But I do have to wonder- instead of trying to downplay the childishness of this big yellow Bat Signal, what if I went the other way and completely ran with the crazy colors and big frilly skirt? A Japanese street fashion Bat Signal dress might be really interesting and fun to play with. Maybe the signal itself is a giant headpiece and I install lights in the dress! Who knows? I’ve decided that my next project is going to actually be to attempt to make a Batman wallet, so stay tuned for whenever that is!